In the experimental hutch, we have the LEPS detector which is optimized for the measurement of charged particles at forward angles. 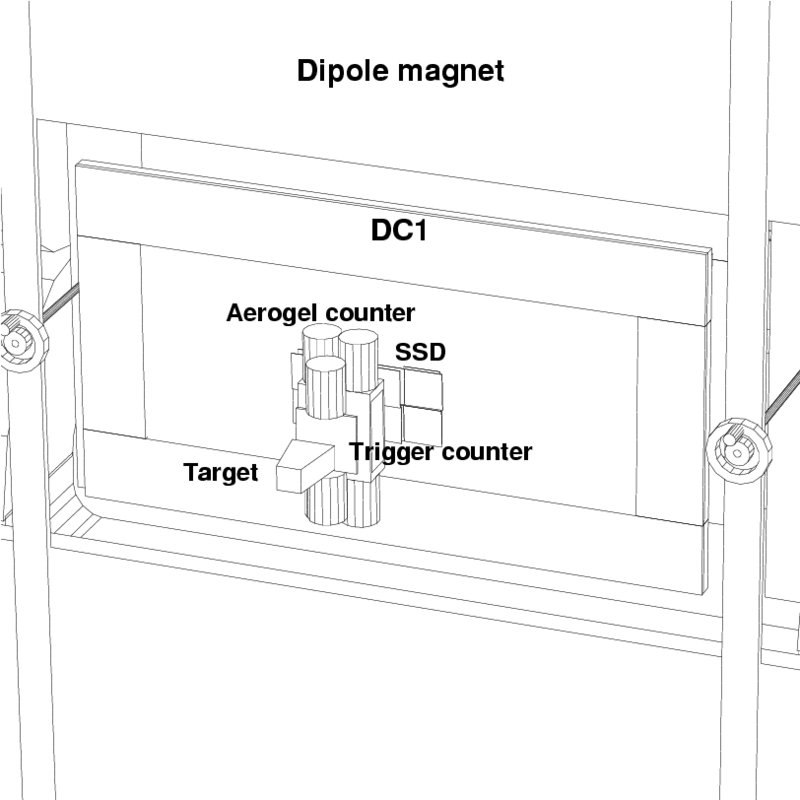 The detector consists of a plastic scintillator after a target (Trigger counter), an aerogel Cherenkov counter, silicon-strip vertex detector, three drift chambers (DC1, DC2, and DC3), a dipole magnet, and time-of-flight (TOF) counters. The opening of the dipole magnet is 135-cm wide × 55-cm high, and the length of the pole is 60 cm. The field strength at the center is 0.7 Tesla. 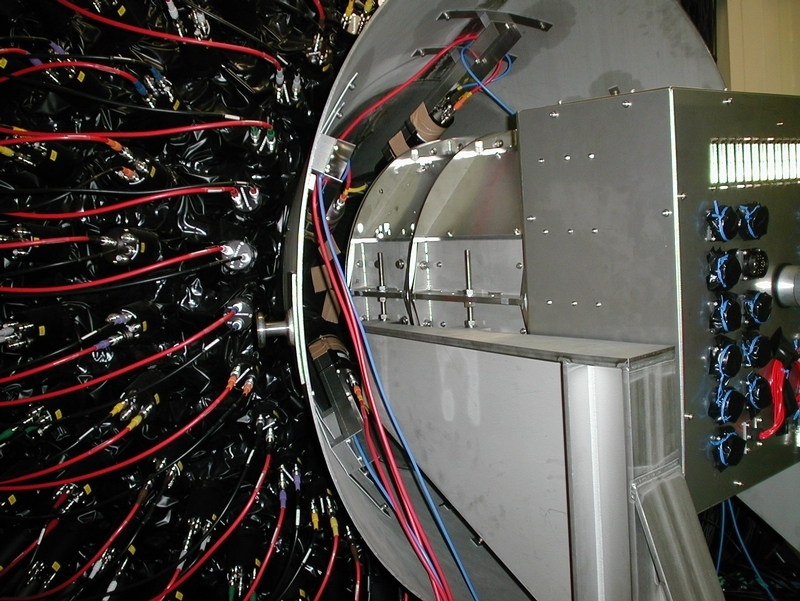 In order to measure the momentum of the charged particles, their trajectories are measured with the silicon-strip vertex detector and drift chambers. The particle identification is performed by measuring the TOF of momentum-analyzed particles from the target to the TOF wall. 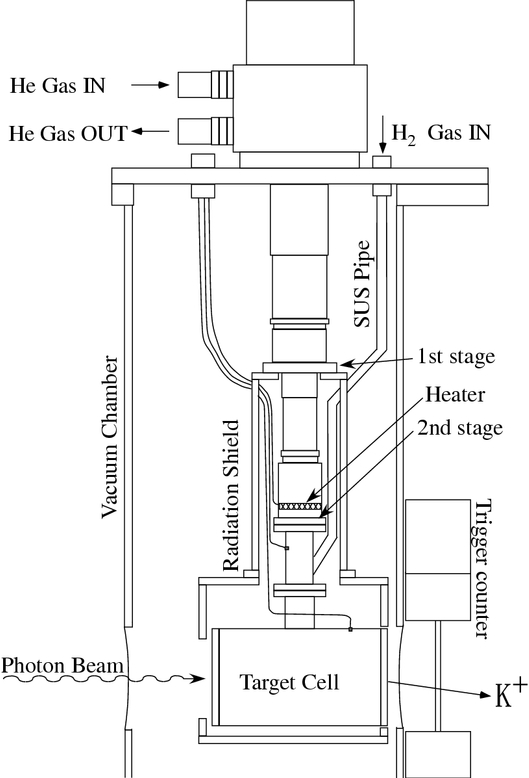 Liquid hydrogen target and the LEPS dipole magnet. Close-up view of the upstream side of the spectrometer. The LEPS DC2 and DC3 drift chambers. We have currently two types of γ detectors. 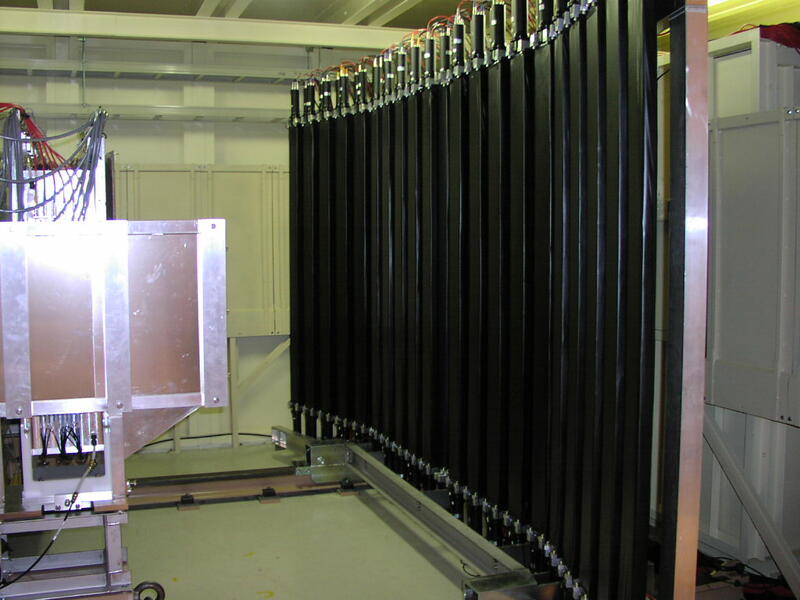 The "backward" detector consists of 252 Pb-Scintillating fiber counters covering from 30 to 100 degrees in the laboratory frame. 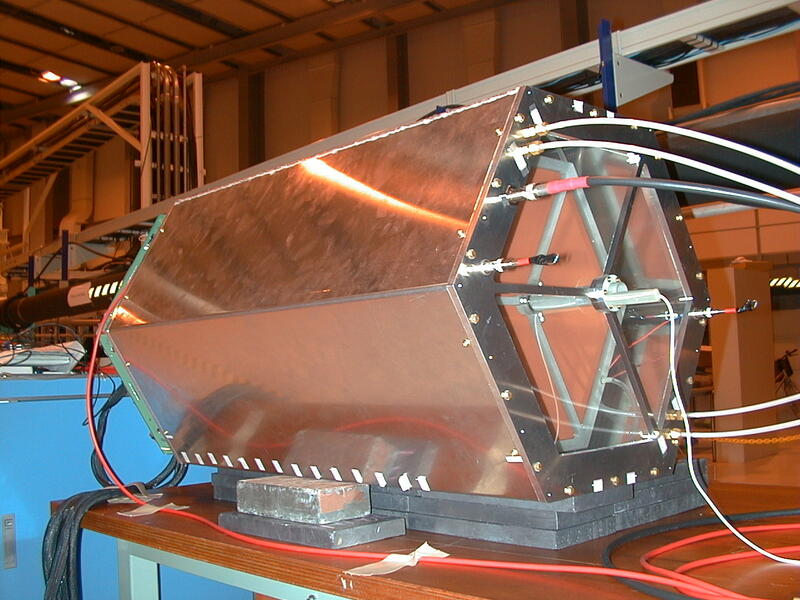 The "forward" detector consists of 252 PWO crystal scintillators and the size is about 40 cm in diameter. Both detectors are under commissioning. The LEPS backward γ detector. The forward γ counter placed downstream of the backward γ counter. 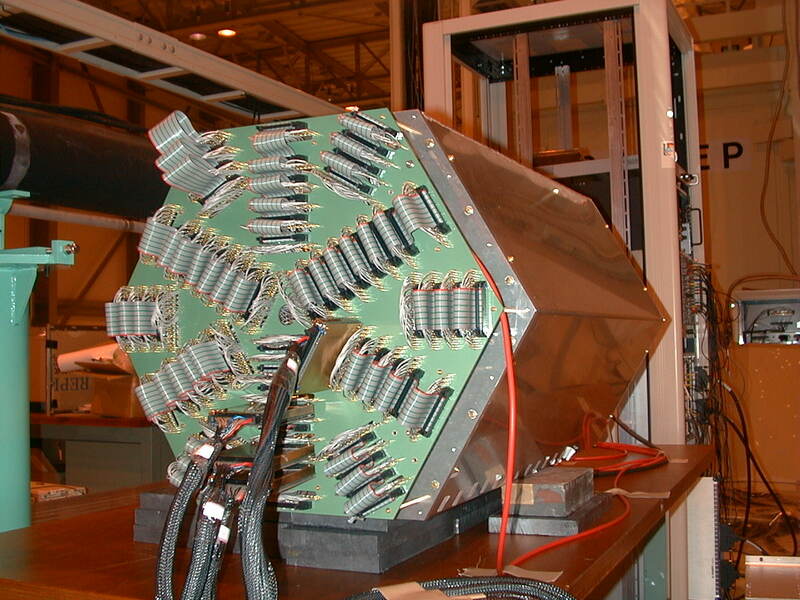 A Time Projection Chamber (TPC) has been constructed as a 4π detector for hadron photoproduction experiment. The TPC has the active volume of 700 mm in length and 350 mm in diameter. It will be installed in a superconducting solenoid magnet. The signals are read out with 1055 cathode pads. The time projection chamber seeing from downstream. The time projection chamber seeing from upstream.